In 1983, a scientist named Richard Muller came up with an interesting theory to explain the almost regular interavals between mass extinctions on Earth.Roughly every 26 million years, the Earth suffers a massive extinction event* in which whole species and ecosystems disappear. It’s widely believed and accepted by the scientific community that the extinction events are precipitated by the impacts of comets and asteroid impacts, but what Muller devised to explain the almost regular event was rather scandalous – what if the sun had an evil twin brother? Muller theorized that, orbiting the sun at a great distance, is another star – possibly a red or brown dwarf which orbits the sun once every 26 million years at a distance of 1 to 3 light years* (this is very distant when you consider that the closest known star, Proxima Centauri, is only 4.2 light years away!) When the star, which Muller named Nemesis after the Greek goddess of divine retribution, gets close to the sun thanks to an irregular orbit, it disturbs the Oort Cloud, the grouping of icy comets and bodies at the edge of our solar system, and sends them on a collision course towards the inner planets. But wait a minute, if Nemesis really is out there, why can’t we see it? According to scientists who support the theory, Nemesis is a brown dwarf star which is a fancy way of saying it’s a failed star. It would be too small to sustain nuclear fusion and would simply be nothing more than a big ball of gas making it dark and very hard to find. However, Muller’s theory does fall under some scrutiny. No where in the known galaxy have astronomers found a star that orbits at the distance that he described. For this and other reasons, support for the Nemesis theory has waned, but it hasn’t died and lives on. * A lightyear is the distance light travels through space in one year. One lightyear is about 5.87 trillion miles or 9.46 trillion kilometers. Unidentified IRAS Sources (1985) | from entry of Houck, J. R.
In November 2010, the scientific journal Icarus published a paper by astrophysicists John Matese and Daniel Whitmire, who proposed the existence of a binary companion to our sun, larger than Jupiter, in the long-hypothesized “Oort cloud” — a faraway repository of small icy bodies at the edge of our solar system. The researchers use the name “Tyche” for the hypothetical planet. Their paper argues that evidence for the planet would have been recorded by the Wide-field Infrared Survey Explorer (WISE).WISE is a NASA mission, launched in December 2009, which scanned the entire celestial sky at four infrared wavelengths about 1.5 times. It captured more than 2.7 million images of objects in space, ranging from faraway galaxies to asteroids and comets relatively close to Earth. Recently, WISE completed an extended mission, allowing it to finish a complete scan of the asteroid belt, and two complete scans of the more distant universe, in two infrared bands. So far, the mission’s discoveries of previously unknown objects include an ultra-cold star or brown dwarf, 20 comets, 134 near-Earth objects (NEOs), and more than 33,000 asteroids in the main belt between Mars and Jupiter.Following its successful survey, WISE was put into hibernation in February 2011. Analysis of WISE data continues. A preliminary public release of the first 14 weeks of data was planned for April 2011, and the final release of the full survey planned for March 2012. A: It is likely but not a foregone conclusion that WISE could confirm whether or not Tyche exists. Since WISE surveyed the whole sky once, then covered the entire sky again in two of its infrared bands six months later, WISE would see a change in the apparent position of a large planet body in the Oort cloud over the six-month period. The two bands used in the second sky coverage were designed to identify very small, cold stars (or brown dwarfs) — which are much like planets larger than Jupiter, as Tyche is hypothesized to be. Q: Why is the hypothesized object dubbed “Tyche,” and why choose a Greek name when the names of other planets derive from Roman mythology? A: In the 1980s, a different companion to the sun was hypothesized. That object, named for the Greek goddess “Nemesis,” was proposed to explain periodic mass extinctions on the Earth. 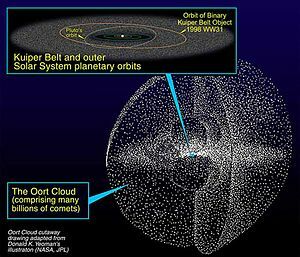 Nemesis would have followed a highly elliptical orbit, perturbing comets in the Oort Cloud roughly every 26 million years and sending a shower of comets toward the inner solar system. Some of these comets would have slammed into Earth, causing catastrophic results to life. Recent scientific analysis no longer supports the idea that extinctions on Earth happen at regular, repeating intervals. Thus, the Nemesis hypothesis is no longer needed. However, it is still possible that the sun could have a distant, unseen companion in a more circular orbit with a period of a few million years — one that would not cause devastating effects to terrestrial life. To distinguish this object from the malevolent “Nemesis,” astronomers chose the name of Nemesis‘s benevolent sister in Greek mythology, “Tyche.”JPL manages and operates the Wide-field Infrared Survey Explorer for NASA’s Science Mission Directorate, Washington. The principal investigator, Edward Wright, is at UCLA. The mission was competitively selected under NASA’s Explorers Program managed by the Goddard Space Flight Center, Greenbelt, Md. The science instrument was built by the Space Dynamics Laboratory, Logan, Utah, and the spacecraft was built by Ball Aerospace & Technologies Corp., Boulder, Colo. Science operations and data processing take place at the Infrared Processing and Analysis Center at the California Institute of Technology in Pasadena. Caltech manages JPL for NASA. Make sure you have Java enabled on your browser to see the applet. This applet is provided as a 3D orbit visualization tool. (over several years or decades) or planetary encounter circumstances. – Tyche , a hypothetical planet in the Oort Cloud supposedly responsible for producing the statistical excess in long period comets in a band. – Fifth planet (hypothetical) , historical speculation about a planet between the orbits of Mars and Jupiter. – Phaeton , a planet situated between the orbits of Mars and Jupiter whose destruction supposedly led to the formation of the asteroid belt . Nowadays this hypothesis is considered unlikely, since the asteroid belt has far too little mass to have resulted from the explosion of a large planet. – Planet V , a planet thought by John Chambers and Jack Lissauer to have once existed between Mars and the asteroid belt , based on computer simulations. Data from NASA’s Wide-field Infrared Survey Explorer, or WISE, has found no evidence for a hypothesized body sometimes referred to as “Planet X.” This body was thought to be a large planet or small star orbiting in the far reaches of our solar system. Astronomers searched millions of images taken by WISE over the whole sky, finding no Saturn-like body out to a distance of 10,000 astronomical units (au) from the sun, and no Jupiter-like body out to 26,000 au. One astronomical unit equals 93 million miles. Earth is 1 au, and Pluto about 40 au, from the sun. This chart shows what types of objects WISE can and cannot see at certain distances from our sun. Bodies with larger masses are brighter, and therefore can be seen at greater distances. For example, if a Jupiter-mass planet existed at 10,000 au, WISE would have easily seen it. But WISE would not have been able to see a Jupiter-mass planet residing at 100,000 au — it would have been too faint. The chart was created by Janella Williams of Penn State University, University Park, Pa.
After searching hundreds of millions of objects across our sky, NASA’s Wide-Field Infrared Survey Explorer (WISE) has turned up no evidence of the hypothesized celestial body in our solar system commonly dubbed “Planet X.”Researchers previously had theorized about the existence of this large, but unseen celestial body, suspected to lie somewhere beyond the orbit of Pluto. In addition to “Planet X,” the body had garnered other nicknames, including “Nemesis” and “Tyche. “This recent study, which involved an examination of WISE data covering the entire sky in infrared light, found no object the size of Saturn or larger exists out to a distance of 10,000 astronomical units (au), and no object larger than Jupiter exists out to 26,000 au. One astronomical unit equals 93 million miles. Earth is 1 au, and Pluto about 40 au, from the sun. “The outer solar system probably does not contain a large gas giant planet, or a small, companion star,” said Kevin Luhman of the Center for Exoplanets and Habitable Worlds at Penn State University, University Park, Pa., author of a paper in the Astrophysical Journal describing the results.But searches of the WISE catalog are not coming up empty. A second study reveals several thousand new residents in our sun’s “backyard,” consisting of stars and cool bodies called brown dwarfs.”Neighboring star systems that have been hiding in plain sight just jump out in the WISE data,” said Ned Wright of the University of California, Los Angeles, the principal investigator of the mission. The second WISE study, which concentrated on objects beyond our solar system, found 3,525 stars and brown dwarfs within 500 light-years of our sun.”We’re finding objects that were totally overlooked before,” said Davy Kirkpatrick of NASA’s Infrared and Processing Analysis Center at the California Institute of Technology, Pasadena, Calif. Kirkpatrick is lead author of the second paper, also in the Astrophysical Journal. Some of these 3,525 objects also were found in the Luhman study, which catalogued 762 objects.The WISE mission operated from 2010 through early 2011, during which time it performed two full scans of the sky — with essentially a six-month gap between scans. The survey captured images of nearly 750 million asteroids, stars and galaxies. In November 2013, NASA released data from the AllWISE program, which now enables astronomers to compare the two full-sky surveys to look for moving objects.In general, the more an object in the WISE images appears to move over time, the closer it is. This visual clue is the same effect at work when one observes a plane flying low to the ground versus the same plane flying at higher altitude. Though traveling at the same speed, the plane at higher altitude will appear to be moving more slowly.Searches of the WISE data catalog for these moving objects are uncovering some of the closest stars. The discoveries include a star located about 20 light-years away in the constellation Norma, and as reported last March, a pair of brown dwarfs only 6.5 light-years away — making it the closest star system to be discovered in nearly a century.Despite the large number of new solar neighbors found by WISE, “Planet X” did not show up. Previous speculations about this hypothesized body stemmed in part from geological studies that suggested a regular timing associated with mass extinctions on Earth. The idea was that a large planet or small star hidden in the farthest reaches of our solar system might periodically sweep through bands of outer comets, sending them flying toward our planet. The Planet X-based mass extinction theories were largely ruled out even prior to the new WISE study.Other theories based on irregular comet orbits had also postulated a Planet X-type body. The new WISE study now argues against these theories as well.Both of the WISE searches were able to find objects the other missed, suggesting many other celestial bodies likely await discovery in the WISE data. “We think there are even more stars out there left to find with WISE. We don’t know our own sun’s backyard as well as you might think,” said Wright.WISE was put into hibernation upon completing its primary mission in 2011. In September 2013, it was reactivated, renamed NEOWISE and assigned a new mission to assist NASA’s efforts to identify the population of potentially hazardous near-Earth objects. NEOWISE will also characterize previously known asteroids and comets to better understand their sizes and compositions.JPL managed and operated WISE for NASA’s Science Mission Directorate. The mission was selected competitively under NASA’s Explorers Program managed by the agency’s Goddard Space Flight Center in Greenbelt, Md. I like this web blog very much, Its great to read and receive information. “Practice, the master of all things.” by Augustus Octavius.